For A Long And Healthy Life, It Matters Where You Live : Shots - Health News Healthy life expectancy is lowest for people in the South, a study finds. People living in the West, Northeast and Great Plains tend to be doing better. But staying healthy is about more than just geography. Healthy habits and access to good health care count, too. It's not just how long you live that matters. It's healthy life expectancy – the additional years of good health you can expect once you hit 65. And by that measure, a new analysis shows it makes a lot of difference where Americans live. Hawaiians are lucky in more than their idyllic weather and gorgeous scenery. Seniors there can expect a little more than 16 years of healthy life after 65. Women in Hawaii can expect more than 17 years. At the other extreme, Mississippi's seniors have less than 11 years of healthy life. Older black Mississippians have only eight years, lower than anywhere except, oddly, African-Americans in Iowa, with seven years. The national average is 14 years. That is, the average 65-year-old American can expect good health until age 79 – a little more for women, a little less for men. Maps in the new analysis, done by the National Center for Health Statistics, show Americans' healthy life expectancy after 65 is lowest in the South. But males in the Midwest, Texas and North Dakota don't do so well either. 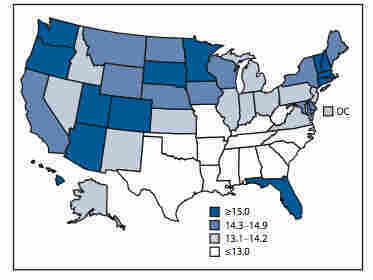 The Northeast, Florida, Upper Plains states and the West have more healthy seniors. The analysis can't say why states vary so much. Environment certainly plays a role, the study's authors say. But so do healthy behaviors, such as exercise and refraining from smoking; getting preventive care, such as vaccinations, cancer screening and blood pressure treatment; and having access to good medical care when needed. The results were published in Morbidity and Mortality Weekly Report. Obviously, socioeconomic status is a common denominator in all these factors, but it's not just a matter of having more money – or spending more on health care. That's borne out by a different study published earlier this month in JAMA, the journal of the American Medical Association. It compared the United States with 34 other developed countries in how long their populations live and how healthy they remain. It's part of an ambitious effort by a group called the U.S. Burden of Disease Collaborators. Strikingly, the U.S. rank declined on every measure of longevity and good health between 1990 and 2010. On "healthy life expectancy," the US went from 14th place to 26th over those two decades – while its already disproportionately high health care spending spiraled ever higher. Commenting on the JAMA study in an accompanying editorial, Dr. Harvey Fineberg, president of the National Institute of Medicine, quoted from an influential 1970s book called "Doing Better and Feeling Worse: Health in the United States." "Despite a massive increase in health expenditures," wrote Dr. John Knowles, editor of that volume, "the nation's health has improved less than was promised or expected. The benefits have not appeared to justify the costs." The U.S. health care dilemma, Fineberg wrote, "remains strikingly unaltered" nearly four decades later.